Our Learn Online websites are a completely free and easy to use system for learning European languages for kids and young adults. We currently offer 6 languages to learn at both beginner and early intermediate levels. Each level consists of 50+ topics modelled on the UK curriculum for Modern Foreign Languages. 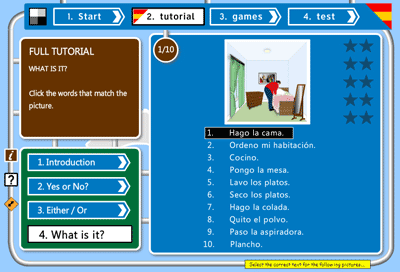 Each of the languages comes with lessons, games and tests for each topic. Each topic can be viewed/read/heared before you start to study the language for that topic using our simple French, Spanish, German, English EFL and Welsh vocabulary pages. These vocabulary pages are also accessible to tablets and other mobile devices. Our language learning lessons use the idea of '3 stage questioning' to help learners grasp the vocabulary they wish to learn. 3 stage questioning is a technique in MFL teaching used for both the oral introduction of new vocabulary and the oral revision of previously taught vocabulary. Stage 1: Yes or No Stage 2: Either / Or Stage 3: What is it? The teacher / our resource shows an image, names the image either correctly or incorrectly and asks the student to agree (with Yes in the target language) or to disagree (with No in the target language). This means that at this stage the learner only has to be able to say/click on Yes and No in the target language. 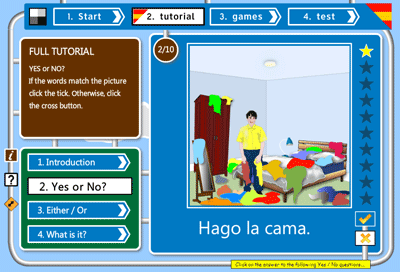 The teacher / our resource shows an image, and offers two words/phrases as an option in the target language. The student has to choose the correct one. 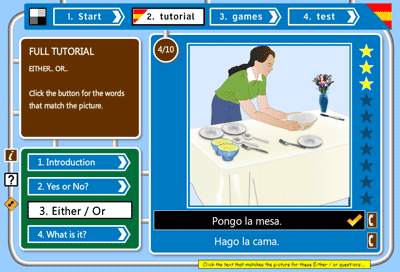 In this more difficult stage the teacher / our resource shows an image to the student and asks for the word/phrase - in class this can be without any help - in our resource, the learner must select the correct word/phrase/sentence from a list. If the student cannot answer at any stage, he / she can go back one stage.